Palmorama: Whatever happened to the Fossil Watch? Whatever happened to the Fossil Watch? It looks like they did make a few models of these other than the one I bought myself some years ago. Back then they were way too big to do use in my view and of course now with watches like the Sony LiveView and the Pebble the technology has moved on. 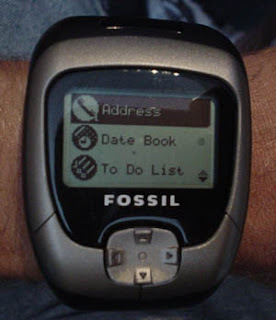 You can still find them on eBay (Fossil PDA Watches on eBay ), but the prices are ridiculously high and I just can't believe that there's the demand for these things.